Helloooooo, is it meee you’re looking for?” Maybe? Just maybe? You might have noticed that I’ve been AWOL for a few months. Everything is fine, not to worry. But, at the beginning of the year, I started trying to get into shape and to cook more, and to generally get my life in order. Turns out, that takes me a lot of time each day, and I kept running out of time t do my nails and struggling to make any nail/blog progress. Then I would feel terrible for posting and get worried about being a terrible blogger and I just felt guilty, so I stopped posting. But…! Now it is starting to be summer (which lightens my workload, since I work at a school), I’m training for my first 5k (which is an absolute miracle considering my unabashed loathing of running), and I’m cooking and baking a couple of times a week. Yay! Moral of the story- I’m starting to feel like I might have my sh*t together a bit better than I did in December/January. But I miss nail polish and blogging! So here I am folks! Maybe I deserve a round of “shame, shame, shaming”, but hopefully you can forgive me and take me back. Now- to the nail polish! To be entirely honest, this has been sitting in my queue for a while, waiting me to get called back to the blogging world by the siren song of nail polish. But how could I not show it to you? It’s too gorgeous to miss! 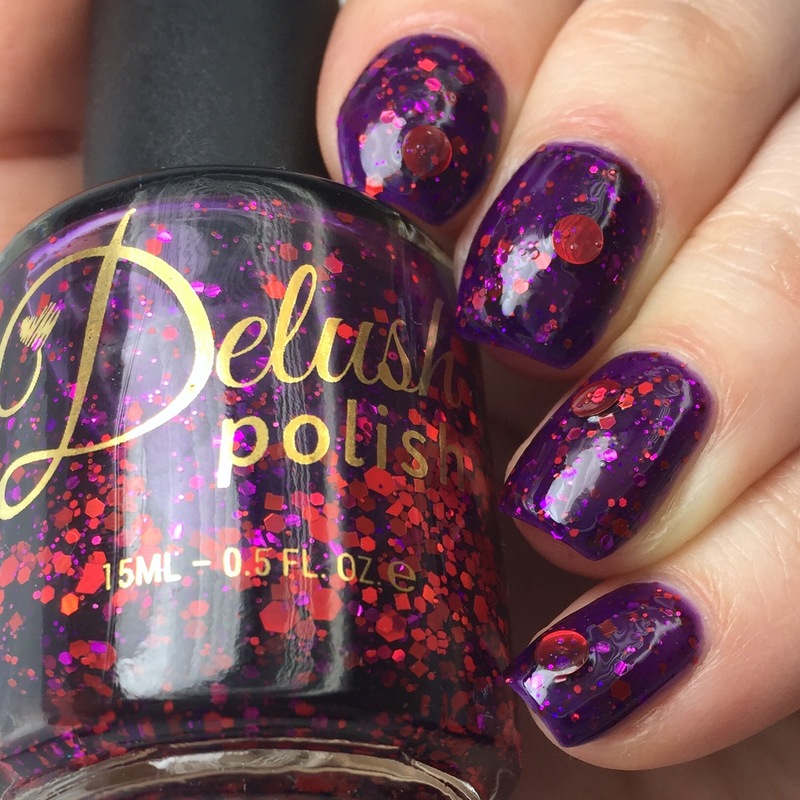 Delush Polish’s “Queen of No Mercy” is inspired by the calculating, [evil? ]genius Cersei Lannister, Queen/Dowager in Game of Thrones. As a huge fan of the books/show (and Delush’s fantastic glitters! 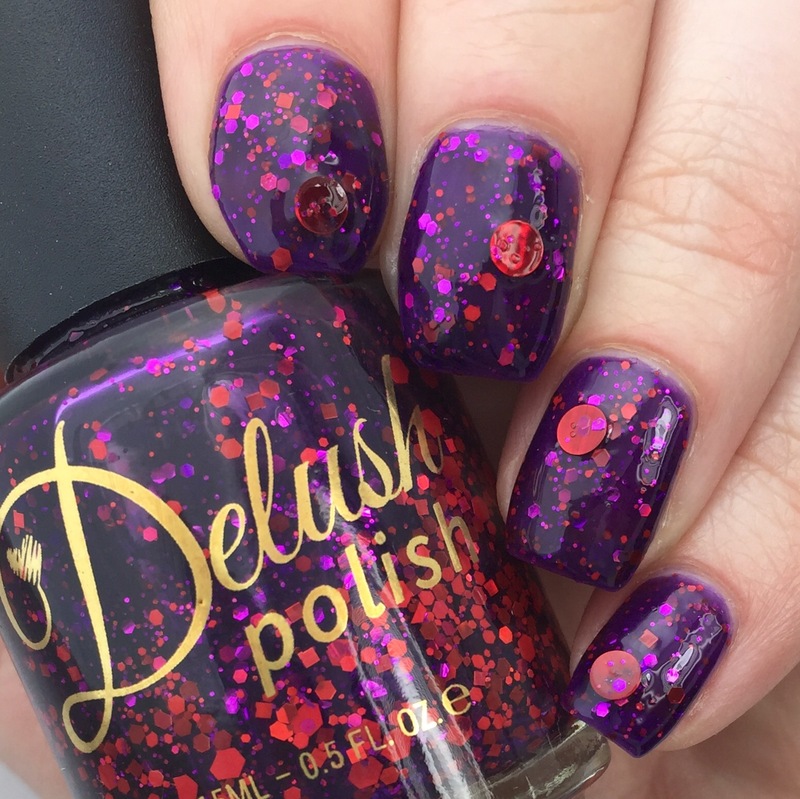 ), I was totally sucked in by the whole collection, especially “Queen of No Mercy.” This one is a deep purple jelly with magenta nd red metallic hex glitters in a few small sizes, plus big metallic red circle glitters. There’s something about the big circle glitter that just screams drama (the good kind) to me. Big circle glitter sits on your nails and calls out to passerby “hey! Check me out! Look how glamorous I am!” The glitter in this polish glows beautifully against the dark jelly backdrop, especially in lower light. The formula is just as great as I have come to expect from Delush. I don’t know how she gets her jellies and crellies so opaque (I suspect maybe the Red Woman is behind it?). This is two coats, and covers very well for me. The glitter load is very good, and goes on smoothly and well-balanced on the nail. I had to fish a bit to grab an extra big circle glitter or two (because I love them and want exactly one on each nail), but the smaller glitter distributed itself perfectly fine and I didn’t have to worry about patchy glitter coverage. 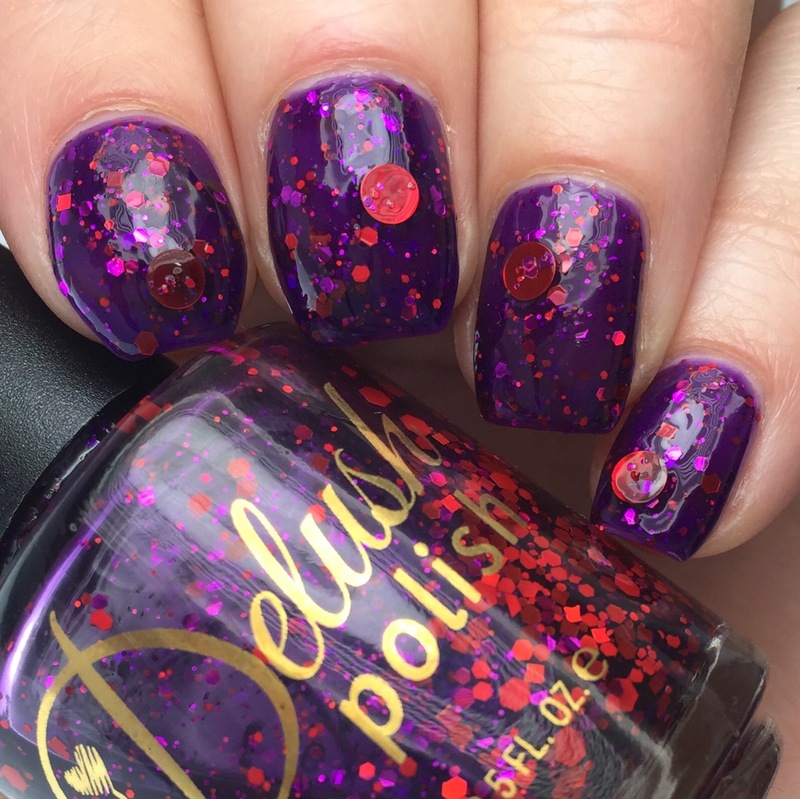 I have a special place in my heart for purple polishes- and I have to say that this is one of my favorite purple glitters so far. I have two more polishes from the Game of Thrones-inspired collection (one channeling Brienne of Tarth and one channeling Melisandre), and I can’t wait to show them to you! Even though it took me ages and ages to finally post this, luckily, you can still buy this collection on Delush’s website. Here’s the listing for “Queen of No Mercy,” which I highly recommend. Plus, Delush is fairly close to me, just outside of Boston, so I feel like I’m supporting someone locally- and their Shipping is super speedy to get to me! I love that “didn’t have to spend a week agonizing over the USPS tracking page while it travels across country” feeling! Thanks for hanging in guys! I’m going to try to be posting once a week while I get my blogging legs back under me (like sea legs, but with more acetone? ), and then I’ll start adding in more posts. This is some squishy goodness for sure!! I love giant circle glitter polishes! Your macro is to die for! And you should feel precisely zero guilt for taking a break – I’m just delighted to see you back!